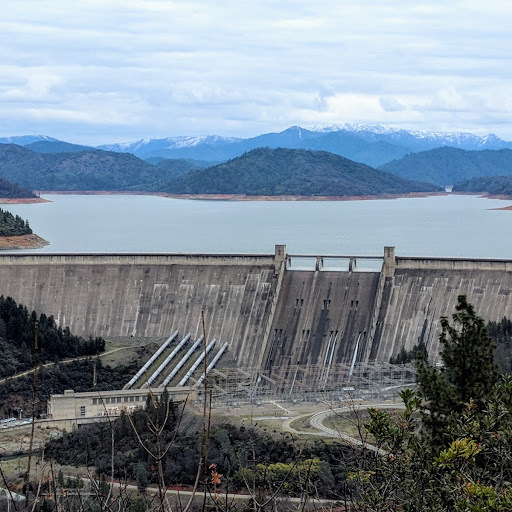 Shasta Dam at Shasta Lake taken on February 7, 2019 showing rising lake waters from the low of late fall. Rain and snow is forecast for the coming week in the North State providing much needed water for the state's reservoir systems and lakes. Prior to this next round of snow and rain producing systems here is a review of some current reservoir data from the CDEC Exchange. In just the last week Shasta has risen over 6 feet sitting just over 56 feet from full pool at 98% of average storage for this date. Trinity, due to more snow than rain in the area only came up a couple of feet holding at 92% of average storage and just over 57 feet of full pool. Oroville is still 164 feet below full pool at 62% of average storage, but much of the lower than average level has to do with the massive spillway repairs underway than lack of snow and rain in the watershed. The major reservoirs of the central state; Folsom, Mew Melones, Don Pedro, McClure and San Luis are all currently holding at over 110% of average storage for this date. With the above average snow-pack in many of these watersheds (excepting San Luis) the outlook for great lake levels in the spring and summer is strong. If the weather continues to cooperate, spring and summer levels for Shasta and Trinity should be outstanding with levels allowing all ramps to be open and all marinas to be fully operational. There should be plenty of area and space for anglers, recreational boaters and houseboaters to enjoy the lakes.